Docked at the wharf in the City of Lunenburg in Nova Scotia, Canada is the historical Bluenose II which become the world's most famous vessel. Situated on the dock behind the Bluenose II is a fisheries museum where visitors can visit and see how the city of Lunenburg once was. 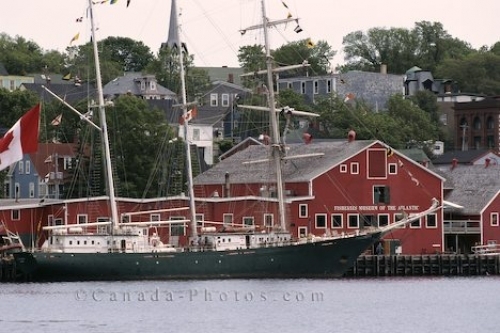 Picture of a large three mast sailing vessel in front of the Fisheries Museum in Lunenburg, Nova Scotia, Canada.